I got it back from my quilter a couple of months ago. Some how it got passed me to share it with you. Then I figured I might as well wait until it got a little closer to Halloween. Great quilting by Kaylene Parry! A feather in the border. Binding = ticking, not biased! A cute little label by Riley Blake and hand embroidered info. finished off the quilt nicely. This quilt was a long time "in the works". I love that it's finally finished. Just in time. A few more details about this quilt can be found HERE. Are YOU working on any "frightful" kind of projects? I absolutely love your quilt! Great quilting too! Amber, that quilt is just perfect for the upcoming ghost time!! You did a beautiful job as did your quilter. I love it. Cute! Nothing on my agenda yet since I have yet to empty all the boxes from out move. In good time this will get done. Oh Amber, that quilt is just adorable! I love the little embroideries. And the polkie border. And the ticking. Toooo CUTE! 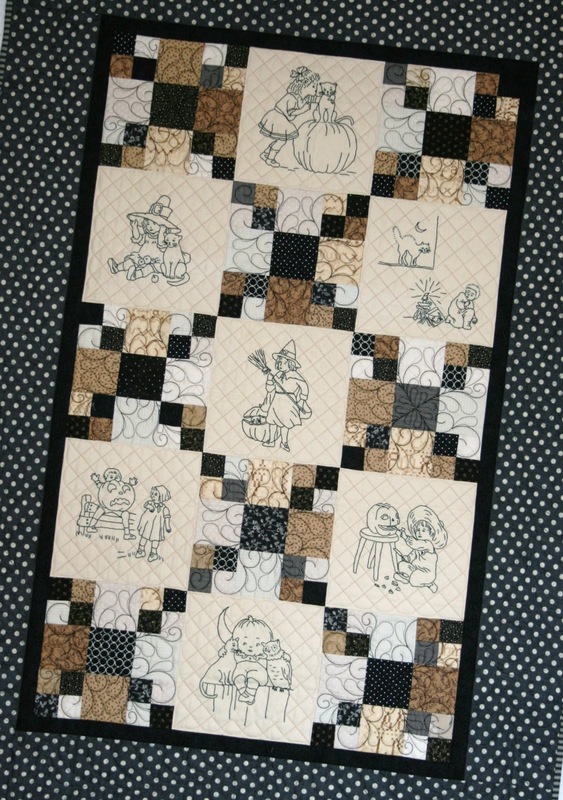 Thumbs up on the Halloween quilt! Love your Jolly Halloween and wow- Haunted Houses!!! I'm working on a very simple table topper with the supper cute Boo to You from last year. 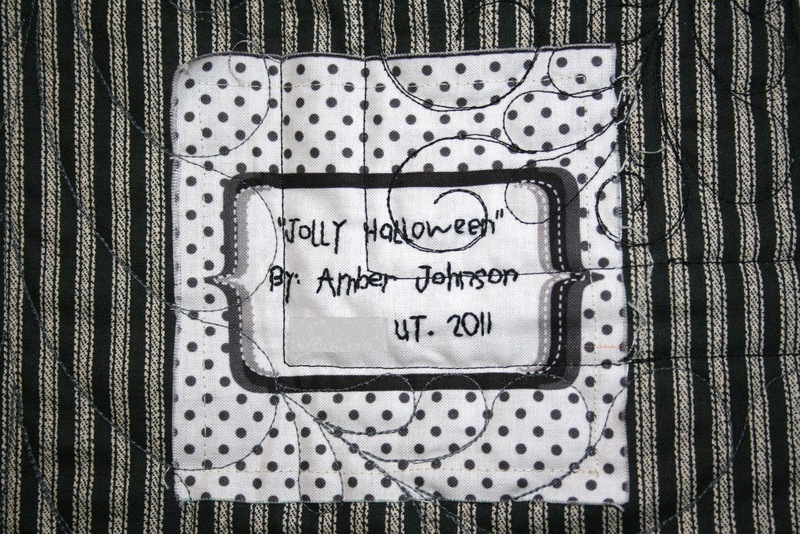 Cute Halloween quilt and your embroidery is beautiful. I'm working on some Ghastlie projects. This is super cute and the quilting is awesome! Thanks for sharing! That is super cute and the quilting is gorgeous. Thanks so much for adding me to you blog roll, it made my day to see my blog there. Are you going to the sewing summit next week in Salt Lake?